The Scottish Mental Health Arts and Film Festival (SMHAFF), one of the largest social justice festivals in the world, is now entering its 7th year. The festival aims to challenge preconceived ideas about mental health through the mediums of theatre, music, literature, dance, visual art and film. The festival aims to show the importance of art in aiding recovery and the artistic talent and beauty can be derived from something that can be so dark and challenging. The festival is organised in partnership with the Mental Health Foundation in association with the following organisations; Scotland’s anti-stigma campaign ‘see me’, NHS Health Scotland, NHS Greater Glasgow and Clyde, NHS Lothian, The Royal College of Psychiatrists, Lanarkshire Recovery Network, Voices of Experience, Healthier Scotland Scottish Government, University of Strathclyde and Bi Polar Scotland. It is clear that the festival is well supported. However, more support is always needed and the best way for this to happen is to spread the word, get along to as many events as you can and show your support. There are some truly fantastic events happening in partnership with the festival, not just in Glasgow but across Scotland, including theatre pieces, writing awards and film premieres. The festival will run from the 1st to the 19th of October. For the full lowdown on what’s happening and where go to their website: www.mhfestival.com. 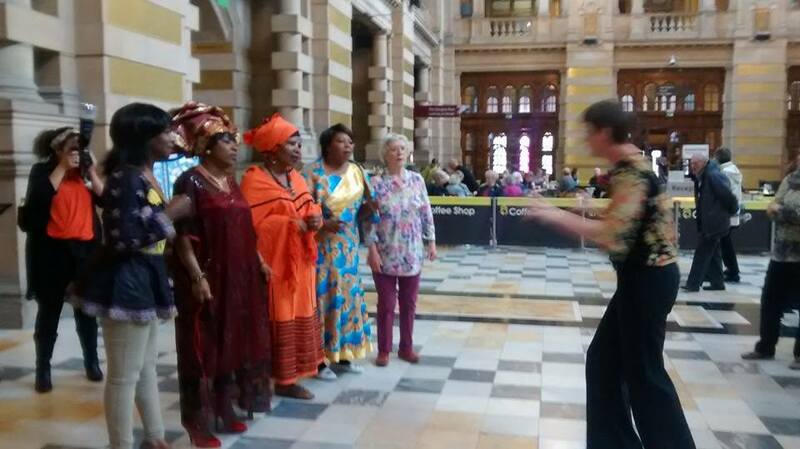 SMHAFF kicked off in style on Wednesday 1st October by taking over Kelvingrove Art Gallery and Museum with their open day “Moving Minds VI: Power to the People.” Throughout the day there were lots of exciting workshops – creative writing, autobiographical writing and tai chi. There was also the opportunity to watch and discuss “Glasgow Girls”, a documentary called “Beyond Prejudice”, music from the Joyous Choir and a fashion and dance show. The festival organisers couldn’t have crammed in any more events if they tried! I had the pleasure of attending 3 of the events throughout the day; “Beyond Prejudice”, listening to the Joyous Choir and watching the fashion/dance show. “Beyond Prejudice” was a documentary created in partnership with Voices of Experience (VOX), which is a service-user led organisation that provides activities and a safe place for those with mental health issues. The film explored the impact of mental illness in Black and Minority Ethnic Communities and the one thing that was repeated by all the interviewees was the feelings of isolation that they experience. They felt that they were viewed as “outsiders” by Glaswegians but they were excluded by their own community which did not understand their mental health problems. Although the documentary was very raw and emotional it was an incredibly enlightening experience as I was able to understand the struggles of those struggling with mental health within the BME community. After watching the documentary, I had the absolute pleasure of going to listen to the Joyous Choir; a group of refugee women from various locations including South Africa, Nigeria and Zimbabwe. The women were all dressed in their traditional African costumes and looked beautiful. Their voices were so powerful that I had real goosebumps when they sang. The Joyous Choir is run in partnership with the Maryhill Integration Network and provides the women with a safe place to chat, sing and have a nice cup of tea and slice of cake. There are also Scottish members of the choir, which helps improve integration and links the two communities. The choir treated us to a rendition of their favourite song, “My Bonny Lies Over the Ocean” which was sung so beautifully and so passionately that it could’ve brought a tear to a glass eye. 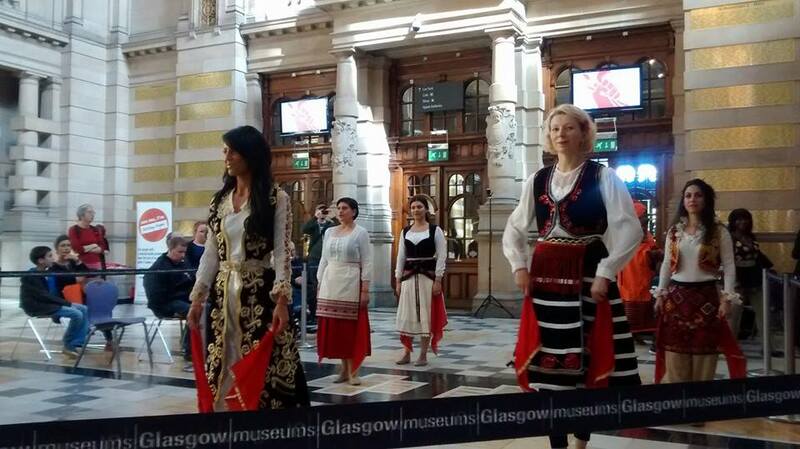 The final event that I attended was a fashion and dance show, which was run by the Maryhill Integration Network in partnership with AlbScot, an organisation that aims to help the integration of Albanian immigrants into the wider community. The fashion show featured models from Albania, Iran, Africa and beyond. All the costumes were either created by the women or donated. The costumes that were created by the women used materials donated from all over the world. For example, a traditional Albanian costume was created with fabrics from Guatemala and India and this not only linked women of different cultures together but also demonstrated the theme of the fashion show: “Weaving Across the World”. The models then treated us to a show of traditional Albanian dancing which, for someone who had no clue about Albanian culture, was incredibly interesting and beautifully performed. Posted in Arts and tagged arts, film, Glasgow, kelvingrove, mental health, Music, smhaff, theatre. Bookmark the permalink.